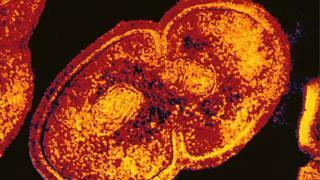 US scientists have re-engineered a vital antibiotic in a bid to wipe out one of the world's most threatening superbugs. Their new version of vancomycin is designed to be ultra-tough and appears to be a thousand times more potent than the old drug, PNAS journal reports. It fights bacteria in three different ways, making it much less likely that the bugs can dodge the attack. It is yet to be tested in animals and people, however. The Scripps Research Institute team hope the drug will be ready for use within five years if it passes more tests. Experts have repeatedly warned that we are on the cusp of a "post-antibiotic era", where some infections could become untreatable. One hard-to-treat infection that has been worrying doctors is vancomycin-resistant enterococci or VRE. It has been found in hospitals, can cause dangerous wound and bloodstream infections and is considered by the WHO to be one of the drug-resistant bacteria that pose the greatest threat to human health. Some antibiotics still work against VRE, but the 60-year-old drug vancomycin is now powerless. The Scripps team set out to see if they could revamp vancomycin to restore its killing ability. They made some strategic modifications to the molecular structure of the old drug to make it better at attacking bacteria where it hurts - destroying cell walls. Three changes in particular seem to be important, increasing the strength and durability of the drug. Lead researcher Dr Dale Boger explained: "We made one change to the molecule vancomycin that overcomes what is the present resistance to vancomycin. And then we added to the molecule, two small changes that built into the molecule, two additional ways in which it can kill bacteria. So the antibiotic has three different, we call them 'mechanisms', by which it kills bacteria. And resistance to such an antibiotic would be very difficult to emerge. So it's a molecule designed specifically to address the emergence of resistance." The modified drug was able to kill samples of VRE in the lab and retained nearly full potency after 50 rounds of exposure to the bacterium. Dr Boger said: "Organisms just can't simultaneously work to find a way around three independent mechanisms of action. Even if they found a solution to one of those, the organisms would still be killed by the other two. "Doctors could use this modified form of vancomycin without fear of resistance emerging." Prof Nigel Brown of the Microbiology Society said: "This development could be hugely important. "Vancomycin is an antibiotic of last resort against some serious infections. There has been great concern that resistance has been emerging."